Karl telling Janae he has one word for her - entrapment. Janelle deciding to write a book. Karl telling Susan to just say whatever it is she has to say. Susan chickens out of what she really wants to say as she tells them that she's been left to tidy up the after the kids and Karl quickly volunteers to help until Izzy pipes up that she's made a breakfast reservation for the two of them, so Susan says he'll cope and sends them off. Izzy gives Susan a long and dirty look before she leaves the classroom and Susan has OMG expression on her face. Lou serves Dylan, Sky and Stinger their drinks then just about has a panic attack when he spots Annalise walking in the door. He quickly tells Harold that if anyone is looking for him then he is “backpacking in Patagonia” before trying to do an impression of a belly dancer whilst he tries to escape unobserved into the kitchen. In the background, Dylan and Stinger drool over her too, much to Sky's annoyance. Annalise comes to the counter asking for an old friend, Lewis Carpenter, since they go a long way back. With Lou shaking his head in he kitchen, she asks if he is here but all Harold can say is “Ah”. Janelle is still working on her book, writing about her first day in the salon when a knock on the door interrupts the flow. She peeks through the net curtains and runs over to Janae who's just come out of the bedrooms and says that the repo man is back and adds a few choice words about him too. She gives it a few seconds, and then opens the door …to repo man coming to collect the TV. 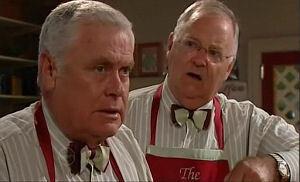 With Lou observing from the kitchen, Harold is keeping Lou's whereabouts secret from Annalise as they make polite conversation. Annalise says that she was sorry to hear about Madge dying. Harold eventually asks what she is doing in Erinsborough, and she tells him that she does documentaries for the BBC and they want to do one on small communities and she knew just the place to do one on – Ramsay Street, Erinsborough! ANNALISE: The Poms are mad about the sunshine, backyards and barbies and all that sort of stuff. Harold tells her to let him know if he can be of assistance and she says that she'd love to interview him and Lou and she will be in touch soon. DYLAN: Smart and hot, that's you babe. At the counter, the still drooling Stinger asks who the blond was and Harold replies that she's making a documentary for television, and he asks if she is one of his girlfriends! And as Lou has crept back from backpacking in Patagonia, Harold tells him that he was being childish and it will make it harder when he meets her the next time. LOU: What else can I do, all that poppycock about documentaries. HAROLD: Well that is what she is here for; look she even gave me her card. LOU: Don't you realise she's come to see me. LOU: It's the old Carpenter magnetism. Younger women seem to go for me. I mean look at Trixie for crying out loud. HAROLD: Oh yes, that was a bigger disaster than the Titanic! LOU: Exactly, that is why I'm determined, determined not to go anywhere near Annalise. Janelle's plea to the repo man fails and the TV is removed. Stinger comes home and says it is unfair but Janae comments that they're just doing their jobs and adds which other family is on first name terms with the repo man! For that comment, Janelle tells her to start earning some money like Stinger and Janae sarcastically says that “Mummy's little golden boy” will get a chapter in her dead boring book for having a job. Stinger suddenly realises that he's going to miss his favourite TV programme on telly and Janelle points out that things will get a lot worse unless they get cash. As Sky exits Grease Monkey's, she gets hassle from three nerds who have just come out of a car. Dylan comes out to see what is going on, and tells them to stop hassling his girlfriend. Sky says she is fine but Dylan grabs one of the nerds by his lapels and firmly warns him to stay away from his girlfriend or else! After a bit of eyeballing, the nerds head into Grease Monkey's and Sky and Dylan head to his car. Susan observes Izzy leaving a room at the hospital and as she walks past, the doctor (Beth Carter) comes out and after a bit of friendly chitchat she reminds Susan she hasn't been for a check-up and to Susan's initial annoyance, tells her that she has a slot free for her. After pondering for a minute, Susan gleefully accepts. In his car, Dylan is trying to explain to Sky why he did what he did earlier with the nerds but she is having none of it, especially after he promised not to do something like that and because he could end up back in jail. Dylan says he is trying but Sky tells him it's not enough because she is scared that one day the violence might be directed at her. Dylan says he'd never touch her or another girl, so she asks him that it is okay to hit a bloke then before asking if that is the sort of person she wants to go out with. Still in Dylan's car, he tells Sky that he's screwed up again. Sky wonders if they're not suited since she keeps picking guys that are total opposites of her, so she can change them and isn't sure why that is. Dylan says it's because opposites attract but Sky's take on it is that she is perhaps incredibly bossy and likes trying to change people. With pleading eyes, he says he would change if he could so he can be the guy that makes her happy. She tells him he is and then adds that they are different in every way but they can't stay away from each other. Harold is giving Annalise an interview for her doco and she asks what Paul's involvement was (they were talking about the new complex and Ramsay Street almost being demolished). Harold tells her to speak to Paul to clarify facts from rumours before asking if she ever met Paul. Annalise replies she did once or twice and Harold tells her he is in the hospital just now if she'd like to ask him about his involvement. Harold suddenly gets a very nasty cough, but he isn't coming down with something, just trying to warn Lou who has come into TGS. Stinger has read Janelle's book on the PC, and after telling her to use a spellchecker, says it is Cuban and will sell millions and Janelle hopes he is right. Stinger tells her about Annalise and her doco for the Beeb as Janae brings out a scrabble set to provide entertainment for the natives. Janelle tells Stinger to get the old telly from the garage and as speaks to them at the door, Dylan comes in and sends Stinger flying like Superman but this Superman crash-lands on the floor after first clearing the contents off the desk. Not caring for her son's well being, Janelle quickly asks Janae to get the camcorder because she's had an idea. Janelle has come up with a moneymaking scheme – setting up a funny moment to win $20,000 from the programme ‘Stupid Aussie'. Janae thinks it won't work but they go ahead anyway and do their “funny moment” – Stinger missing his footing going up a ladder and landing but putting his foot into a bucket, then shaking off the bucket and standing on a rake and it coming up and hitting him in the face (ouch), then knocking into a wheelbarrow and the handle hitting him in his tender region as he falls to the ground. Janelle wants a retake to make it look more agonising but Stinger says no and tells her Janae's “singing” is more agonising. As they sneak back into the house, Janelle comes up with Plan B – recording Janae doing her “Brittney” impersonation by “singing” ‘Stop Callin Me'. Cue hilarious laughter when she eventually spots them… after she's fallen over the table. Janae wants to destroy the tape but Janelle pleads that the $20k will help pay off the debts and Janae throws the tape onto the sofa as she storms out of the house. Beth's pager goes off and she apologises to Susan saying she has to go and asks if she can see herself out once she's finished dressing. Once Beth leaves and Susan is finished dressing, she decides to do a search on the computer for Izzy's patient history. Susan is gobsmacked when it comes up saying that the father was unknown. Janae interrupts Karl as he finishes his lunch and he comments that she missed her last appointment with him. She says that she took his advice (telling Kayla she was trapping Boyd and in the long run she'd be sorry) and so didn't need to chat with him. Karl is stunned and tells her he thought they were speaking about her situation and picks up that she is upset about something and wants to talk about it with her. Unfortunately Dylan interrupts them tying to do an impersonation of her and she rudely tells Karl that she'll make an appointment through the school if she needs him before storming out. Dylan surprises Sky in the kitchen wanting to know where Harold is. Sky replies she's doing his Salvo rounds before asking why but Dylan quickly kisses her and leaves. A surprised Dylan is caught working in the garden by Harold. 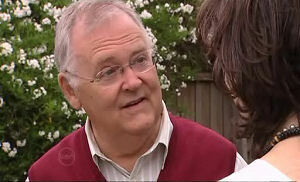 Harold explains he's doing his Salvo work tonight so David can join him before asking why Dylan is in his garden. Dylan says he just thought he'd help out and Harold thinks he's very kind but Dylan says he owe's him. Paul isn't giving Annalise the answers she wanted for the doco, commenting that the locals have already made up their mind and he is the “Anti-Christ”. Annalise comments on the type of firm Affirmacon were but Paul still keeps quiet. Harold is a shocked at Dylan damaging his house and at the thought that Dylan pulling a few weeds from the garden could make up for what he did. Dylan tries to explain that he did it because David was getting treating him and his family. 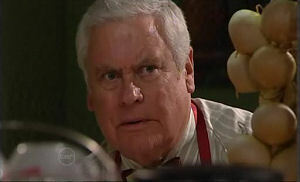 HAROLD: And you think that this is just retribution do you? Look this is the home I shared with my late wife, this is the home where my family and I used to feel safe but you've destroyed all that. Dylan tries to explain why he did it and Harold wants to know how long Sky has know about it and he says a couple of weeks. Harold has another go at him for sharing meals and being in his home without saying anything and Dylan wants to know what he can do to make it up but Harold sends him away. Izzy is giving her interview to Annalise – she loves Erinsborough because when the chips are down, everyone pitches in. And after seeing Lou do a 180, tells her she met the man of her dreams in Erinsborough too – Karl Kennedy just as Susan comes in. She embraces Annalise and says they will catch up once she's had a word with Izzy and gives Izzy the option stopping the interview or letting Annalise carry on filming, she doesn't mind. Izzy replies they can carry on later and they head off to the office for their chat. In the office, Izzy wants to know why Susan was rude outside. SUSAN: It's about your baby. I know it wasn't Karl's. You have 24 hours to tell him Isabelle or I will.